At Baripada in Mayurbhanj district of Orissa, only women are allowed to pull the rath of Subhadra. The unique tradition started in 1975 when the district administration proclaimed on the occasion of International Women's day that henceforth, only women were to pull Subhadra's rath. Every year, thousands of women jostle to hold the sacred rope to pull the chariot. Women devotees from across the state annually pour in at Baripada to avail the opportunity and take great pride in pulling the rath from Jagannath temple in Baripada to Mausui Maa temple located nearby. The Baripada Ratha Yatra is significant because nowhere else in India are women given this special privilege to pull the chariot. The participation of women in the festivities is what has made the Ratha Yatra at Baripada an extremely popular event. 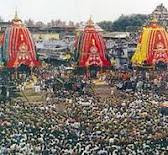 The whole idea of the Rath Yatra was to tell people to treat trees and forests as god and save the depleting forest wealth and environment. The idols of the gods were replaced by herbal plants and saplings of other useful plants. This unique Rath Yatra, dubbed by the media as Green Rath Yatra, was organised by the Manav Adhikar Seva Samiti, a social organisation and Pragati Mahasangh of Paikmal. The three chariots, meant for the sojourn and journey of the gods, were decorated with different plants and taken through some 15 villages of Paikmal to spread awareness among the villagers about the various plants that are grown in the nearby Gandhamardan hills. Thousands of saplings were planted during this Green Rath Yatra. Meetings and seminars were also organised at many villages to discuss various aspects of environment and forests. These meetings were attended by the local forest officials, block officials and staff of the Government Ayurvedic College of Paikmal who participated in the programs to educate the people. The chariot carrying Lord Jagganath is called the Nandighosh, which is 45-foot high with 16 wheels each having a diameter of 2.13 metres. Balabhadra's carriage Taladhwaja is a foot less in height with 14 wheels, while Subhadra travels on the Padmadhwaja that stands 43 feet tall and has 12 wheels. Each of the chariotshave four wooden horses attached to them. Three new wooden chariots are made every year in Orissa for the journey of the three deities from the local Jagannath temple. The three chariots for each of the deities resemble a temple structure and are pulled by a rope by enthusiastic devotees and pilgrims. A team of approximately 14 to 15 tailors are engaged institching up the covers for the chariots that require nearly 1200 meters of cloth. Unlike the chariots, which are mended every year since they lie out in the open, the idols of Jagannath Mandir are not remade every year. The idols are replaced with new ones only in a year which has two Ashad months. This happens every 12 to 19 years. This event is known as Nav Kalevar (meaning "new body"). The idols are designed exactly as the original and also painted in the same manner.